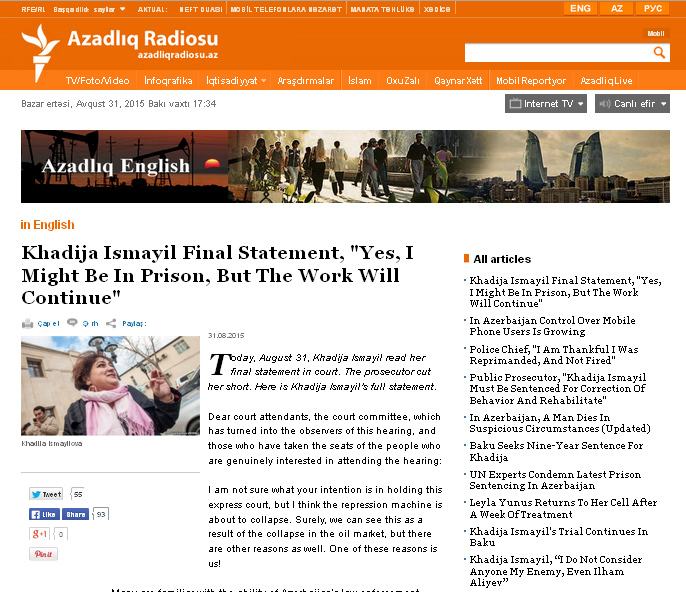 Khadija Ismayil: "I might be in prison, but the work will continue"
Surely, as Mustafayev said himself, all of this is nothing more than slander. And to force him to be part of this slander, the Ministry of National Security and the Baku city prosecutor had their sleeves rolled up -- the same Ministry of National Security which was in charge of installing a hidden camera in my apartment in 2011 and responsible for blackmailing me in 2012; the same city prosecutor's office that tried to cover the very same crime as hard as they could and this is why I sued them. You have probably seen the movie If Not This, Then That. You must also remember the famous character of that movie – the wife of the brother. Assuming the bride and the groom were spending their first night together, she tried peeking through the keyhole. Inside, Server makes Meshedi Ibad withdraw; he is holding a gun. In the meantime, the wife of the brother does not call anyone for help because she is actually seeing what she is imagining but not what is happening in reality. So those plotting against me are acting like the wife of the brother. They are so enthusiastic that they don’t know they are going to fall once the door opens. I am certain, real journalists and mindful citizens will continue exposing election fraud. What I ask from my colleagues and Azadliq Radiosu is this: let this year's “Election Train” program be different from previous ones only in having the voice of a different anchor. The rest of the team should work with the same interest and passion despite the difficulties of exposing fraud. Let us not forget, this is our country. Let us not sacrifice it with our silence. I am here in a good company. I am sharing the same fate as Leyla, Intigam, Anar Mammadli, Ilgar Mammadov, Tofig Yagublu, Rashadat Akhundov, Ilkin Rustamzade, and religious folks who were arrested for their principles and beliefs, defenders of human rights, and journalists. Don’t worry about me.